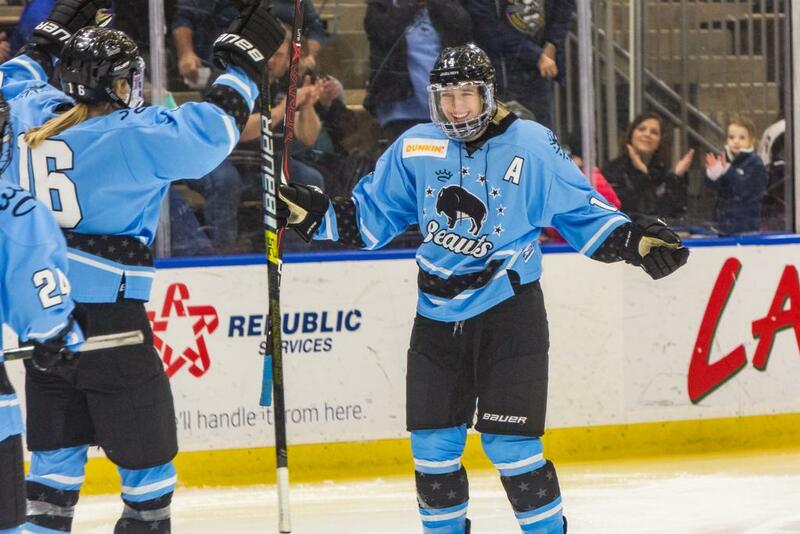 With the Buffalo Beauts and Metropolitan Riveters squaring off for the first time since the 2018 Isobel Cup Final, the Beauts picked up a decisive 5-1 win to push their win streak to three games. After the Riveters had taken the Cup with a 1-0 victory last season, this was a rematch that had been eagerly anticipated all season long. While Buffalo would come away with the win in this game, the stage has been set for three more epic regular season battles. The Riveters drew first blood, but the Beauts scored five unanswered goals to improve to 7-4 on the season. Hayley Scamurra scored twice, while Maddie Elia, Julianna Iafallo, Kelly Babstock each had a goal and an assist, and Blake Bolden finished the day with a pair of helpers. With 7:22 remaining in the first period, the Riveters converted at even strength. 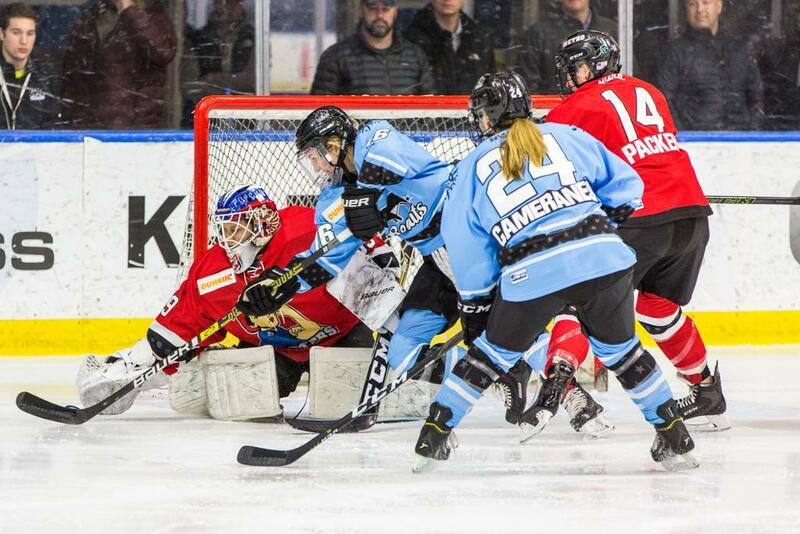 After some scrambling in front of Beauts goaltender Nicole Hensley, Madison Packer pounced on the puck and converted for her sixth goal of the season. Defender Courtney Burke and forward Amanda Kessel earned the assists on the Packer tally. The helper from Kessel was her league-leading 13th assist of the season. She has totaled 13 assists in only 11 games. It didn’t take Buffalo long to return the favor. Less than 10 seconds later, Bolden skated in along the wing with two Riveters beset upon her. Bolden fed a pass over to an ever-dangerous Elia who was open on the other side. Elia rifled a shot over the right shoulder of goaltender Maria Sorokina. The puck caromed off of the crossbar and into the Riveters net to knot the score 1-1. "I'm getting a little bit more comfortable each game," Bolden told the media following what would end up being a two-assist performance. "It's been great to mesh with the girls." With less than five minutes to go in the opening frame, the Beauts took a lead of their own. The puck was worked down low by defender Lisa Chesson. Scamurra jammed the puck home into a mostly open net. Chesson and forward Dani Cameranesi earned the assists on the goal, which was Scamurra's eighth on the season. The Beauts got their first power play of the game at the 18-second mark of the second period. Scamurra converted again roughly half a minute into the player-advantage. Receiving a pass from Elia, she sailed a wrister to the blocker-side and beat Sorokina for her second of the game. Bolden would pick up the secondary assist on the power play tally. Buffalo went back to the power play with 16:02 to go in the second. With 16 seconds to go in penalty, Chesson carried the puck in down low once more. After Chesson chipped it out front, Iafallo chipped it in on her backhand and in behind Sorokina. With the Beauts up 4-1, Metro's coach Randy Velischek pulled Sorokina in favor of Katie Fitzgerald. After the Riveters’ Miye D'Oench went to the box for slashing with 9:36 to go in the game, Chesson fired a shot at the Riveters net. Fitzgerald made the initial save but a large rebound came out. Buffalo's Kelly Babstock was parked in front of the Metro net. She quickly swiped the puck into the Riveters' twine to make the score 5-1. Iafallo and Chesson earned the assists on Babstock's second of the season. By game's end, Hensley had stopped 24 of the 25 shots that she faced. With Sorokina and Fitzgerald splitting the duties for Metro, they stopped 22 of the 27 shots sent their way. While Buffalo comes away with victory, it is only the first of four matchups between them and Metro. With Buffalo losing in one week's time defenders Sarah Casorso and Sarah Edney to retirement, they know that they will need to remain strong going forward. "We've just got to basically stay really good in our conditioning," Bolden said after the game. "We've got a solid D-crew, so there's really nothing that we can do (about the retirements). We just keep doing what we're doing." Casorso, a third-year Beaut and Isobel Cup champion, retires from the NWHL having played 42 regular season games - all with Buffalo - and totaling 18 assists in that time. "Right now, I think I've already coped with the harsh parts," Casorso told the media after the game. "Leaving a big part of your life behind is extremely hard. It was very, very emotional for me to get through these last couple weeks as I've been thinking about it more seriously. Right now, I think I'm just feeling relief and excitement for the next steps in my life, and really looking forward to putting my all into a new passion." Both teams host the Boston Pride for their next games, with the Riveters taking on the Pride on January 20 at 2 PM at RWJBarnabas Health Hockey House before Boston heads to HarborCenter on January 26 for a 1:30 PM puck drop. Tickets are available at NWHL.zone/tickets. 3rd-Star: Juls Iafallo (1G, 1A).